Chief Government Ekpemupolo (aka Tompolo) last night became the last of the key militants in the Niger Delta to lay down his arms and embrace the amnesty offer of the Federal government. During a ceremony at the First Lady's Conference Hall, Presidential villa, Abuja, to mark the peace deal. It took a lot of pleas from top government officials present and members of his entourage to get Tompolo summon up courage to make his brief speech at the event. Tompolo, who was billed to make a speech after the Defence Minister and Chairman of the Presidential Committee on Amnesty, Maj-Gen Godwin Abbe, (rtd), Governor Emmanuel Uduaghan of Delta State and Chief Tony Anenih had all spoken, became jittery, bemused and confused and could not put himself together to make the speech. Sensing that he was having problems with spoken English, there were suggestions to him to speak in his native language while somebody would translate from the audience. After about five minutes of dilly-dallying ,he managed the terse remarks. In his remarks, President Umar Musa Yar'Adua, who just jetted into Abuja in the evening from his home in Katsina, expressed gratitude that Tompolo was able to take advantage of the amnesty offer 26 hours before its expiration. “I thank God for this ceremony taking place barely 26 hours to the expiration of the amnesty,” the president said. Continuing, the president said, “I thank Tompolo and all members of his immediate team for accepting this unconditional offer of amnesty. Tonight belongs to you Tompolo. By signing this amnesty, you have demonstrated that the interest of the Niger Delta is better served through peace. “Your act is a great act of courage and this nation has set an example for the rest of the world to follow. With the action taken by Tompolo, the stage is set for the post amnesty period. The post amnesty period is more challenging than the amnesty period. “Now we will have to work together with the militants leaders to ensure that the programme for the rehabilitation and reintegration of the young men and women takes off successfully. Also members of the amnesty committee and other stakeholders will make inputs into these programmes to ensure that the programmes would be acceptable. “The other issue is to sit down and look at the issues that led to the agitations in the first place and ensure that they are resolved to the satisfaction of all Nigerians. Present at the occasion were also Secretary to the Government of the Federation, Alhaji Yayale Ahmed, Chief of Defence Staff, Air Chief Marshall Paul Dike and the Director General of the State Security Service (SSS). Others were Honorary Adviser to the President on Niger Delta Timi Alaibe, and the National Coordinator of NAPEP, Dr. Magnus Kpakor. 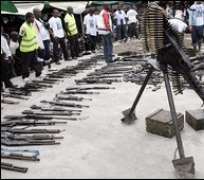 Meanwhile, a mad rush among militants in the Niger Delta was yesterday witnessed in an effort to beat today's midnight deadline for the amnesty as leader of the Niger Delta Vigilante Movement, Mr. Ateke Tom, Leader of Niger Delta Strike Force, Farrah Dagogo, Burster Rhymes and several other groups submitted their arms in Rivers State. They submitted various degrees of weapons ranging from Brownie, anti-aircraft guns, rocket Propelled Grenade launchers and bombs, dynamites, rocket chargers, General Purpose Machine Guns, Sticker grenades and several tons of assorted ammunitions. Others who have submitted their arms include the group from Rumuekpe whose arms were so small that it became obvious they merely wanted to handover something and benefit from the amnesty. The major show was the submission by Ateke which took place at the Tourist Beach in Port Harcourt. Immediately after the monthly environmental sanitation, some boats were dispatched to take journalists to Ateke's camp in Dutch Island from where he came for the exercise. Ateke caused a stir in Port Harcourt. Rather than land at the beach jetty, he decided to go through the waterfronts and trekked from there waving to people as he was being entertained by different groups of dancers till he got to the venue of the submission nearly two hours after his boys had brought the arms through the Tourist Beach. He displayed two of his newly acquired jeeps one of which is a Hummer during the procession. He had his boys waving all sorts of arms with those carrying GPMGs leading and closely followed by one who carried a sophisticated sniper rifle fitted with telescopic lens. When he entered the arena, more traditional dances were displayed for him before he moved round the beach and headed straight to the platform where his weapons were on display. The venue was very rowdy with some people openly smoking Indian hemp and drinking straight from bottles of gin. Some people including journalists were assaulted by the apparently high spirited boys. He later took the microphone and appealed to the boys to listen to him since he was their leader maintain decorum at the arena. He said he wanted peace especially following his conviction that Yar'Adua was sincere and would solve the problems of the Niger Delta. He said all hands should be on deck for peace to be attained, adding, “As me I don submit my guns, every other person who has gun should come and submit it for peace to reign. That does not mean we are weak, but let them do wetin dem say dem go do”. He also threatened that if Governor Chibuike Rotimi Amaechi goes ahead with the planned demolition of waterfronts there will be war, pointing out that other people ruled the state without causing such problems to the people. However, Farah Dagogo, out-going Commander of MEND, said in another statement: “Today October 3, 2009, I, Farah Dagogo, overall field commander for the Movement for the Emancipation of the Niger Delta (MEND) accepts together with field commanders in Rivers state, the Presidential offer of amnesty to militants who lay down their weapons. “In line with conditions attached to this amnesty offer, we are surrendering all weapons under our direct control. “We are accepting this amnesty with the hope that it will usher in a true spirit of reconciliation exemplified by dialogue and federal presence with an aim to addressing the root cause of militancy in the Niger Delta. As we signify our willingness to put to test the government's preparedness to address the problems of the people of the Niger Delta, I appeal to those still determined to fight on, to consider first the option of dialogue. In the same vein, it is my sincere desire that the government immediately embarks on dialogue to forestall a resurgence of violence in the Niger Delta. There are still thousands of people willing to continue fighting in the creeks and only the actions of the government can win over our brothers still bent on fighting. As soldiers, we are not competent to dialogue with the federal government on these serious issues affecting the region. We wish our brothers and sisters who we hope will commence with the intellectual struggle for justice in the Niger Delta, the very best and pray for a just and peaceful Niger Delta.